Last week Aaron Judge created some headlines when he told Manny Machado he would look good in pinstripes prior to a game against the Orioles. That is technically against the rules, so MLB told Brian Cashman to tell Judge to knock it off. Stuff like that happens all the time though. Judge’s mistake was telling the media. “Everyone always jokes around about a lot of things, and things that we say on the field usually stay on the field,” Machado said after Baltimore’s game with the New York Mets on Friday. Machado will become a free agent after the season and the Yankees are widely expected to pursue him, though there is still an entire season to be played between now and then, and lots can (and will) change. Make no mistake though, the club’s expected pursuit of Machado will be a season-long storyline. I have a few early questions about Machado and the Yankees. 1. Will Machado insist on playing shortstop? 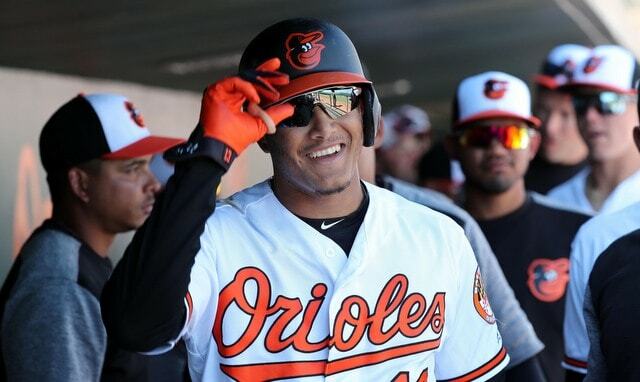 This season the Orioles are going to play Machado at shortstop, his preferred position, presumably because they’re trying to make him happy before attempting to re-sign him. He came up as a shortstop and he has played there at the MLB level — Machado played 45 games at short when J.J. Hardy was hurt in 2016 — and chances are he’ll handle it just fine. Machado’s a great athlete and a great defender. The Yankees already have a pretty good shortstop in Didi Gregorius, however, and if things go according to plan this season, they’ll have three legitimate big league caliber shortstops in the organization at this time next year (Gregorius, Gleyber Torres, Tyler Wade). Things (probably) won’t go according to plan though, and besides, Gregorius will be a free agent following next season. The shortstop position is open beyond 2019. Forgetting about Torres and Wade for a second — they’re prospects until proven otherwise — signing Machado would necessitate one of three things. One, moving Machado back to third. Two, moving Gregorius to another position to accommodate Machado. Or three, trading Gregorius to accommodate Machado. Ideally the Yankees would keep Didi and add Machado. They’re both awesome! It might not be possible though. 2. What if the Yankees don’t need a third baseman? This is the other thing. The Yankees have two pretty promising — and young! — third basemen in Brandon Drury and Miguel Andujar. Andujar is a top 100 prospect now and clearly the Yankees like Drury, who is only 25. He’s not even three full months older than Greg Bird. The Yankees sure seem to think Drury has lots more to offer than what he’s shown in his MLB career to date. It is entirely possible the Yankees will go into next offseason with a quality shortstop (Gregorius) and a quality third baseman (Drury or Andujar). That would be the ideal scenario as far as I’m concerned. And, if that happens, where does it leave Machado? Maybe the Yankees will decide to sign Machado anyway because he’s so damn good and he’ll be only 26 when he hits the open market. That’s kinda what happened with Giancarlo Stanton, right? They already had a great outfield, but they added Stanton anyway, because he’s really good. 3. They’re going to go over the luxury tax threshold, right? To sign Machado, the Yankees will have to go over the luxury tax threshold at some point. If not next season, then soon thereafter, once Judge and Gary Sanchez and Luis Severino start making real money through arbitration. The luxury tax threshold does increase in the future years, but not by much. The threshold tops out at $210M in 2021, the final year of the current Collective Bargaining Agreement. Not a big increase from $197M this year. I am a luxury tax plan skeptic. The Yankees are going to get under the threshold this year to reset their tax rate, I have no doubts about that, but I am not sold on them exceeding the luxury tax in future. Or at least I don’t expect them to blow by the threshold and rack up large luxury tax bills again. A few million to get that final piece at the trade deadline? Yeah, sure. I’m not sure Hal Steinbrenner will okay anything more. He’s been adamant about not needing a $200M payroll to win a championship and I believe him. So, the Yankees will either have to go over the threshold to sign Machado — go over by a lot too once Judge and Sanchez and those guys hit arbitration — or they’ll have to shed money to make Machado fit the payroll. Hey, maybe Stanton will opt out of his contract in three years and make the luxury tax situation easy. The Yankees couldn’t bank on that though. Signing Machado without running a payroll well over the threshold may not be possible. 4. Wouldn’t it be better to spend money on pitching? Very possible. Too early to say, but very possible. The Yankees have offense to spare — Andujar, Torres, and either Wade or Neil Walker won’t have a lineup spot come Opening Day — and a pitching rich farm system, though pitching depth has a way of disappearing quickly. There are always quality bats to be bought in free agency. Quality arms? They’re harder to come by. Because of that, the Yankees may be more inclined to spend their available payroll dollars on pitching help rather than another bat next winter, especially since the offense doesn’t appear to be lacking. Dallas Keuchel and, assuming he opts out, Clayton Kershaw will be free agents next year. Cole Hamels is another potential option. Looking at the roster, it is not crazy to think the Yankees will need rotation help more than another infielder come next season, even with all the arms in the farm system. Another starter may be the proverbial missing piece. Judge was doing nothing more than joking around with Machado. A real recruiting pitch would’ve taken place behind closed doors. The fact remains Machado is scheduled to become a free agent after the season, and it is widely expected the Yankees will pursue him once they get under the luxury tax threshold this year. They definitely have the money to sign Machado. Will they spend it? Will they even need another infielder? Those are questions that will be answered over the next eight months or so. Right now, signing Machado doesn’t seem so cut and dried to me.